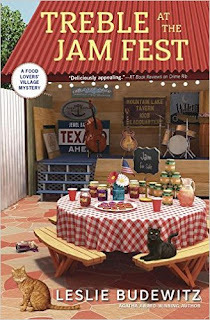 The Killer Characters' Cozy Up to Summer book giveaway continues! Leave a comment below for a chance to win a signed copy of any Food Lovers' Village Mystery--reader's choice! 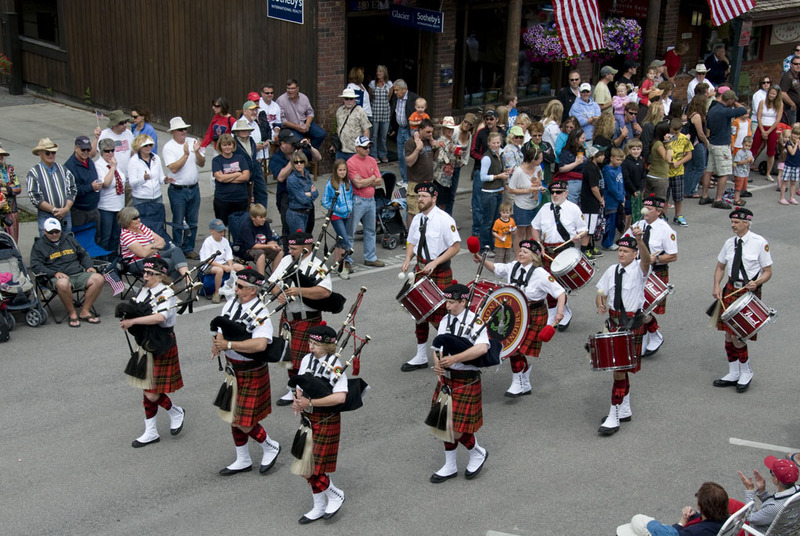 But the best parades of all are small-town parades, and Jewel Bay’s is quite possibly the best. My favorite part is the little dancers and gymnasts. It can’t be easy, dancing to a beat on a boombox one of the parents is carrying, or doing handstands and pirouettes on the hot asphalt while wearing a tutu with your hair up – the heat can undo them -- but they are so cute. One year the organizers goofed and let the Back Country Horsemen ride in front of them. I was so mad I could have screamed. The classic cars and trucks are always popular. Seems like every Camaro owner in the county wants to show off, but it’s the really old rigs I enjoy – the 1950 turquoise Ford Thunderbird, the pink Chevy, the Model A, the 1924 Rolls Royce. Even some of the old farm trucks clean up good! For several years, a darling boy dressed as Super Man and rode through town – it’s only three blocks – strapped to the front of his grandparents’ golf cart, fists clenched, arms in the air. I bet his arms were tired by the time the parade reached the park, where they serve all the kids ice cream. People were a little sad to see him grow up and grow out of the part. Some business sponsor floats—the nursery always decorates a truck like a garden. I enjoy seeing some of the residents of the senior home riding and waving. And the kids love collecting the candy. There are bagpipers, clowns, and mountain men, and occasionally llamas. The Playhouse kids, all young actors, climb up in a big old farm truck and sing show tunes. I’m not crazy about election years and all the campaigners. Yes, it’s a great opportunity to see and be seen, and we are celebrating our independence, and free and fair elections are a huge part of our American heritage. But those little tiny paper flags are a bear to sweep up afterwards. The volunteer fire department trots out its old tanker—the water tank looks like a Russian samovar. 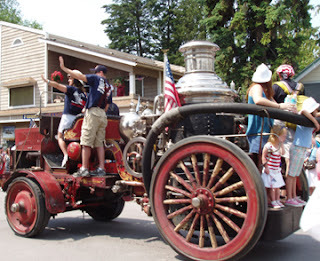 And bringing up the rear is the Caldwell’s big antique fire truck, loaded with Lodge guests. Schedule your family reunion at Jewel Bay’s dude ranch, and you might end up riding in the parade! Keith Caldwell loves pulling the cord to ring the old horn, but what everyone waits for is the water hose, cooling us off! What Fourth of July celebrations do you have on tap? I haven't been to a parade in years but they are such fun. Have a happy and safe 4th of July everyone. I live in the Land of 10000 lakes, so seeing nearby fireworks over a body of water is a must! Thanks! we are going to my parent's house for the week. we plan to fish, have a cookout and we can see fireworks from their driveway! Ha -- I misread this as grilling your neighbors, an entirely different kind of fireworks! I love parades also and I think that I will love this book. Thanks for sharing. I love parades! Thanks for the chance. Watching the 4th fireworks in the park. Love seeing all your plans! Mine? 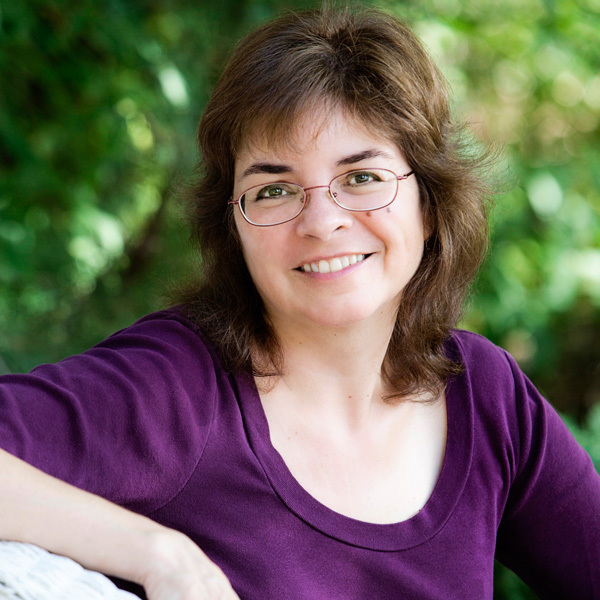 I'll head over to see my mother Fri & Sat, sign books in Helena on Sat, and come home to hang out with Mr. Right and Mr. Kitten. Lots of great food planned, and yes, a parade! No special plans for the holiday. 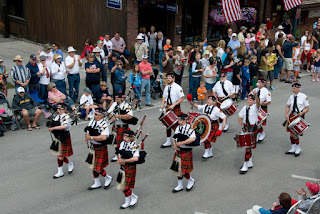 I live in a small town which has a four day homecoming celebration which includes a parade similar to the one here. Love how small towns celebrate the kids and sports, and make homecoming a town-wide event! Strictly family related activities. We will of course visit my mother-in-law at the nursing home, work around the yard, cook out, and try to take in some fireworks. I am not sure what my plans are yet. I am definitely going to be watching the fireworks in the evening. Thank you so much for the chance to win! Remember to leave your email address if you'd like a chance to win TREBLE -- Mr. Kitten has many superpowers, but finding you without an address isn't one of them! 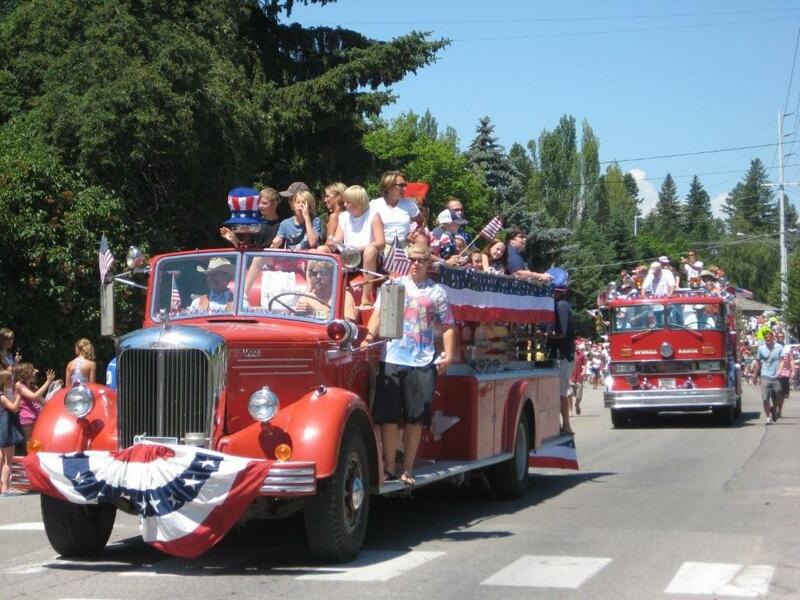 We have a little parade here in our community on July 4th. A neighbor has an antique fire truck that leads the way. My grandchildren love to watch the parade, if they happen to be visiting. A 4-piece banjo band? Now that would be quite a sight and sound! We'll walk in Crown Point's parade & have a cookout at Grandmas (we do all the cooking/cleaning). We can see the fireworks from her house! My main recollection of holiday parades was the high school band marching in their wool uniforms. It would be terribly hot and as the speeches went on they would start fainting from the heat. Mr. Right remembers playing the trumpet when his high school band, the Great Falls Charles M. Russell High School Rustlers, marched in the 1971 Rose Parade. Montana kids in wool uniforms, boots and hats in So Cal? Hotter than blazes but he loved it anyway! I love small town parades! When I was in high school I marched in the band and got in the games for free. As I got older, I still enjoy the local parades. We'll go to our town's parade if the weather is nice. I haven't been to a parade in years. Our town has a 4th of July concert and fireworks following the concert. Looking forward to the fireworks this year. It's been years since I've been to a parade. 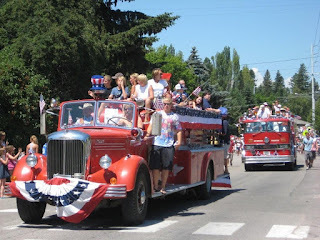 Maybe I should brave the crowds and go to our local parade on the 4th. Fireworks are obviously high on the lists here! We often go sit with friends on a hill above the lake and watch from there. Some folks watch from their boats -- I'm not sure we're gutsy enough sailors to do that! A year or two ago, the fire danger was so high that all displays had to be cancelled. Happily not the case this year! No 4th of July celebration is complete without fireworks! Thanks for the chance to win one of your books. My car club has a party to watch the fireworks from a home on the hilltop overlooking the city. Tis hard on the pups sometimes, for sure. Shower them with extra love! We have an awesome fireworks display across the Mississippi River on July 3rd. Fireworks over the Mississippi sounds fabulous! Congrats to the winner of TREBLE AT THE JAM FEST: Autumn Trapani!